Frederick William Gould was the third son and fourth surviving child of Nat Gould and his wife Elizabeth Madeline Gould nee Ruska. He was born at Wotton Lodge, then the family home in Bedfont, Middlesex on 2 December 1898. 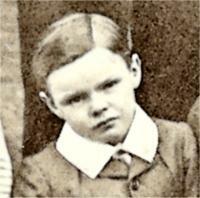 In 1911 he was attending a boarding school at 39-41 Harold Road, Margate in Kent run by the headmaster F.C. Pearce with his wife, two assistant masters, a matron and four servants. There were 50 boys at the school aged from seven to sixteen years old, Frederick being in the middle of that age range. After leaving school he worked as a clerk in the office of the solicitor J. Lister Walsh of 16 Finsbury Circus, London E.C. He enlisted in the Army on 25 November 1916 aged 18, having passed his medical examination in Grade A1, and was posted to the Machine Gun Corps in which he served as a private soldier until the end of the war. His Regimental Number was 125527. Serving in the 34th Battalion of the Machine Gun Corps he was posted to France on 4 February 1918 with the British Expeditionary Force. Only three months later, on 9 April 1918, he suffered gas shell poisoning, and by 29 September in that year he was suffering from bronchitis. Subsequently he spent 135 days in hospitals, first at Quarry Place in Shrewsbury, then in St George’s Hospital at nearby Pontesbury, and finally at the Beaucroft Hospital in Wimborne in Dorset. He left hospital on 14 February 1919 and was discharged from active military service on 15 March 1919, four months after the war ended, being transferred to Class Z Army Reserve or Demobilization on 12 May 1919. His condition was recorded by the Army doctor as “not in final stationary condition”, nor was his disability expected to last more than six months. This evidently proved to be incorrect however, and the effects of his being gassed seems to have continued. He was too ill to attend his father’s funeral in July 1919. Of his later life little is known. It has proved impracticable to search through the very numerous men of that name in the marriages and deaths entries in the records of the General Register office.